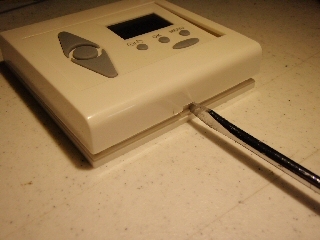 FAQ: Can a timer be used with electric blinds? A timer can be used to activate our radio equipped blind and shade motors using RF (Radio Frequency) for transmission of a remote control signal. This is a four part article series on how to set up the timers. Please Note: The Vera home automation system gives much better control over times, and can also track the change in dawn/dusk times over the course of a year. It costs more, but not that much, and represents great value. 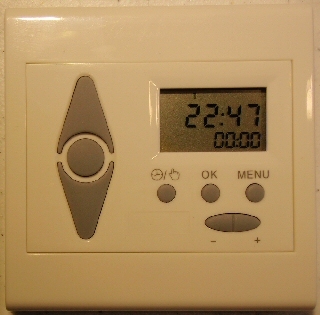 It is also very user friendly, whereas our stand-alone timer is not. The MCT-1-RF wireless wall mounted timer transmits the radio signal to a small antenna in the motor; a microprocessor then decodes the signals to activate the motor. The timer is able to memorize a total 18 different timing event triggers, organized in a sequential fashion from Monday to Sunday. It can also be used in conjunction with our sunlight sensor. The RF signal is also capable of passing through walls and in many cases can reach anywhere inside a typical home. Our multi-channel hand held remotes have up to 14 channels that can be programmed to control blind motors in various different rooms and hallways throughout the house. These remotes transmit the same signal as the timers and can be used in conjunction with them. The first step in setting these timers is to remove the cover, exposing the battery compartment and several concealed setting switches. There are two slots on the top and bottom of the timer that accept a flat screwdriver blade, as in the picture on the left. When you rotate the screwdriver blade in each slot, it will pop the clamps inside the unit, releasing the top cover. You can then lift off the cover, exposing the battery compartment and the setting switches. The battery compartment is on the left side of the unit. The battery itself (supplied) is a standard 1.5 volt AAA unit and will be marked with a positive (+) (top) and negative (-) (bottom) terminal. 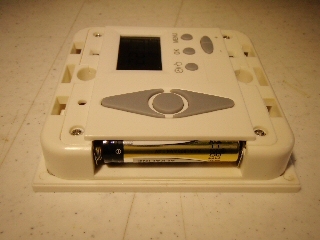 The battery should be inserted with the bottom (negative) terminal against the spring inside the battery compartment. NOTE: Please wait 5 minutes for the self-check to complete and for the circuitry to stabilize, before entering any settings. The unit will be ready for programming when the clock display changes to 00:01 if it has not been previously pre-programmed. Also, when you remove the battery to change it, there is a built-in temporary battery to allow you enough time to make the change without losing all the settings. If you want to reset the unit and erase all settings, leave the battery out for 5 minutes or longer, until the standby battery has fully discharged.